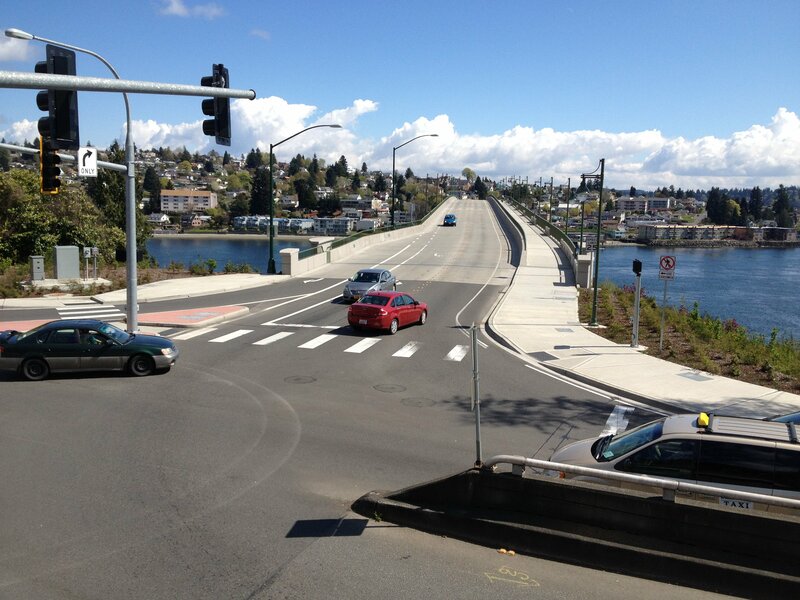 With all the construction projects going on around Bremerton these days, it’s easy to overlook the work recently completed on Sheldon Boulevard near Evergreen-Rotary Park. Crews this week just laid down new pavement that runs on the street for almost the whole length of the park and also put in a new sidewalk. 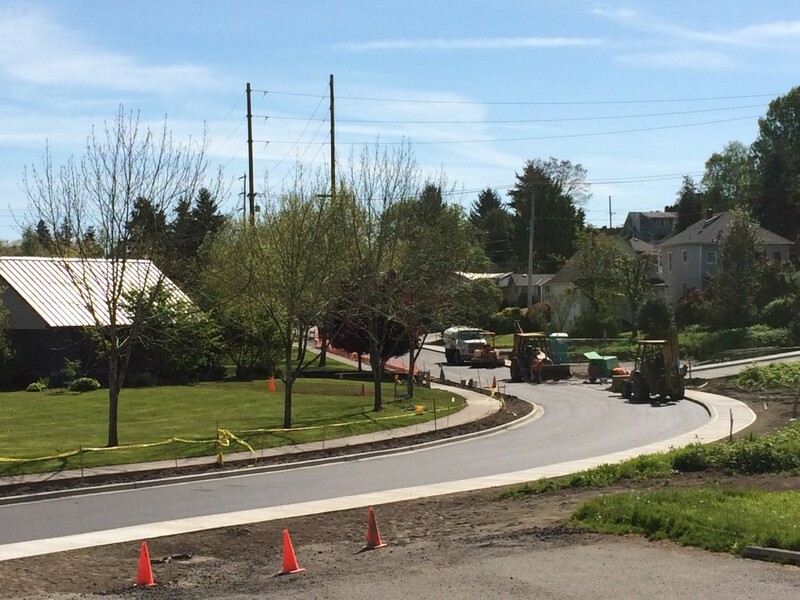 You can see from the photos above — before and after — that some new pavement was long overdue. But a new street surface was not the impetus for the project. 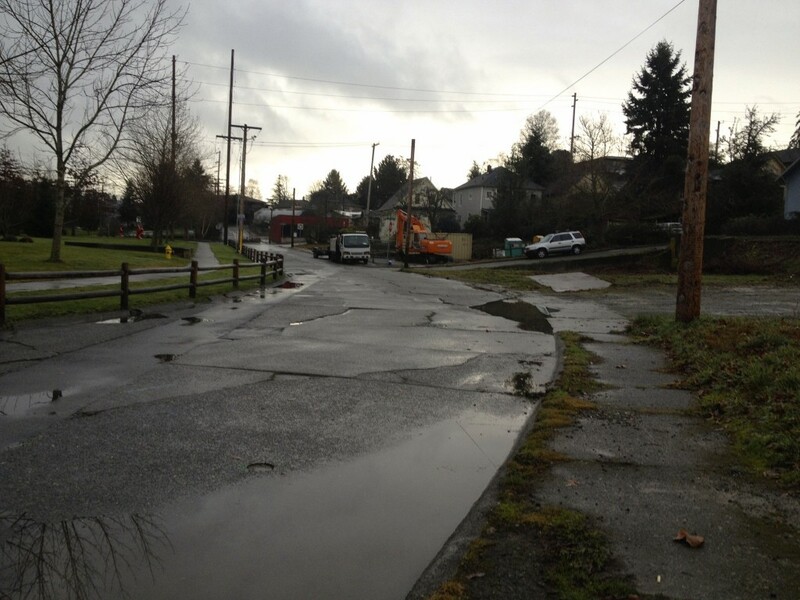 Aging sewer and water lines dating back to the 1930s were literally rotting underneath it, and needed to be replaced. To boot, the city’s Public Works and Utilities Department is rerouting entirely a section of pollution-causing sewer pipe that run along the beach that fronts the Port Washington Narrows. To get it off the beach, they’re installing a new pipe that will run on the streets that parallel the beach, to include Washington Avenue. But don’t expect things to get too cozy down near the park. Remember that a big park renovation project, installing Kitsap County’s first accessible playground, is about to get underway. And a large apartment project is planned along Sheldon Boulevard as well. He just wanted to kill some weeds. But an environmentally conscious Bremerton City Council told Public Works Director Chal Martin last Wednesday they wanted to make certain that green practices were followed as part of an upcoming maintenance project. At issue was a $44,000 contract with Superior Maintenance Solutions to apply herbicide and eliminate weeds that are growing out of city sidewalks. The work is a pilot project for the city. The project includes the weeding and cleaning of sidewalks around the city, as well as tree and shrub trimming around the sidewalks. But most members of the Council were concerned what herbicide would be used. Glyphosate, used in products like Roundup, is called for the in the contract. That got the Council inquiring. Were there alternatives? Why not just use vinegar and water to get rid of the weeds? Could we run a test to see if said vinegar would be as effective? Martin said he’d look into it. His reaction was, as best I can put it, one of slight exasperation. “I just want to kill weeds,” Martin said to conclude the discussion. The contract with Superior Maintenance Solutions, which still calls for Glyphosate, or some alternative of it, will likely be passed Wednesday at the Council’s regular meeting at the Norm Dicks Government Center. Meeting starts at 5:30 p.m. The full meeting agenda for Wednesday can be found here.